How should new technologies be assessed? 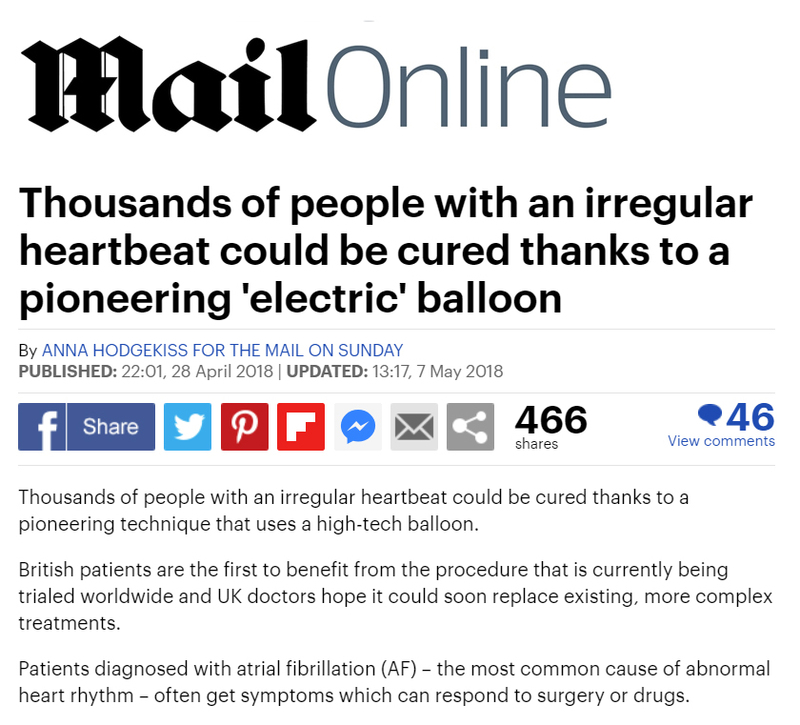 The huge growth in AF ablation, and the complexity of the procedure has led to great interest in the development of new technologies to try and make the procedure quicker, safer and more effective. Whether one technology or technique is superior to another can only be proven in randomised controlled trials. This is a clinical trial where patients suitable for treatment are randomly allocated to receive one of two treatments being tested. The reason that patients must be randomly allocated is to prevent bias (both conscious and subconscious) on the part of the researcher. For example, if a researcher has been involved in developing a new technique they may have a tendency to allocate patients more likely to have a good outcome in that treatment and the more difficult patients in the rival treatment. Randomisation avoids this bias. How are new technologies assessed? It may surprise you to know that while new technologies have to undergo rigorous safety testing before being approved for use they do not have to be shown to be superior to existing treatments. Therefore many new technologies have not even been shown to be superior to placebo or medication in randomised trials. The claims made for technologies are often based on uncontrolled series of patients or even theories developed from observation in animal experiments. Therefore when deciding on how you wish your AF ablation to be performed it is important to know not what technology the doctor uses but what their personal results are and how many they have done. If your doctor is not collecting their follow up results in a rigorous manner they don’t really know what their results are, and therefore whether the technology they use actually works. If your doctor does know what their results are then you should be guided by them as to what technique they feel works best for them. What new technologies are available? The most common method for AF ablation used today is to perform point-by-point RF ablation to create a wide encirclement of the veins (see catheter ablation). Multiple randomised trials have shown that this technique is superior to drug therapy and therefore it is reasonable to use this as the gold standard to judge other therapies and techniques by. Alternative approaches have focused on using alternative energy sources, or technologies to make delivery of the RF easier. The cryo balloon is comprises of a balloon on the end of a catheter which is inflated in the left atrium and then jammed in each of the pulmonary veins in turn. When the balloon is in the vein it is then frozen by passing gas through the catheter. Where the balloon is in contact with the vein it causes freezing of the tissue and cell death. This renders the tissue electrically inert. The damage caused by cryoablation is less traumatic than RF and therefore it is less likely to cause damage to the veins. Unsubstantiated claims that cryo is less likely to cause stroke have never been proven. In addition cryoablation can be associated with damage to the nerve that stimulates the diaphragm (the phrenic nerve) but this does not usually cause symptoms and in all published reports has recovered within 12 months. The potential problem with cryoablation is that it only works if the balloon is in contact with the tissue and while the balloon is perfectly circular, the pulmonary veins are not. Modifications of the cryoballoons now mean it is very rare to have to use additional catheters or RF ablation to complete the procedure. Our team performed the first randomised study to demonstrate that cryo ablation is superior to RF ablation in patients with paroxysmal AF https://www.ncbi.nlm.nih.gov/pubmed/26727045 . For this reason, it is our technology of choice for first time paroxysmal AF patients. Focusing ultrasound beams emitted from a balloon catheter placed in the pulmonary veins, has been shown to create effective circular lesions. The problem with this technology is that in early trials of human use there appeared to be a high incidence of damage to structures outside the heart including phrenic nerve damage and oesophageal damage. These trials have at present been abandoned while the technology undergoes review and redesign. A number of different circular RF ablation catheters have been on the market in recent years. They do not appear to have a great advantage over other technologies and in some studies have been associated with a high stroke rate. For this reason we do not use these technologies. This is a system where the catheter is not bent by a puller wire inside the catheter and is floppy. The tip of the catheter has metal in it and strong magnetic fields are used to bend the catheter. The catheter can be advanced using a motorised drive unit placed on the patient’s groin which allows the operator to control catheter movement from outside the catheter lab and away from x-rays. The advantage to this system is that perforation by the catheter seems very unlikely because the catheter is so floppy that it cannot be pushed through the heart wall. Whether this is really an issue is not clear because although blood leaking out of the heart is a known complication of AF ablation this is rare, and is often related to the transseptal puncture required to access the left atrium with any technology, or as the result of an RF lesion causing perforation. Nevertheless the magnetic system allows precise manipulation of the catheter around the heart and therefore the potential for very accurate RF lesion placement. One of the technical challenges has been to produce a cool-flow catheter that is sufficiently floppy to allow the magnets to manipulate it. Cool flow describes a catheter where saline is passed down the central lumen of the catheter and sprayed out of the end over the catheter tip. This is generally used in AF ablation because we believe it may reduce the chances of blood clot formation on the catheter tip and therefore stroke (unproven in randomised trials). The difficulty of maintaining the integrity of a central lumen used for the saline and making the catheter floppy has now been overcome and this catheter is now in use. This may however explain why magnetic navigation has been in clinical use for almost 10 years and no data demonstrating that it is effective for AF ablation have been published. There are concerns that the magnets may not be able to bend the catheter with sufficient force to produce adequate RF lesions but this again is not substantiated. Watch the recently filmed CNBC TV interview regarding the innovative Hansen Robot – designed to give surgeons accurate and stable control of catheter movement during complex cardiac procedures.